In early February, Some people got excited that Ricky Gervais (atheist) and Stephen Colbert (Roman Catholic) had a short (very short) debate about the existence of God on Stephen’s show (Watch the clip here). In my opinion, even a short debate on primetime TV about God is a good thing. 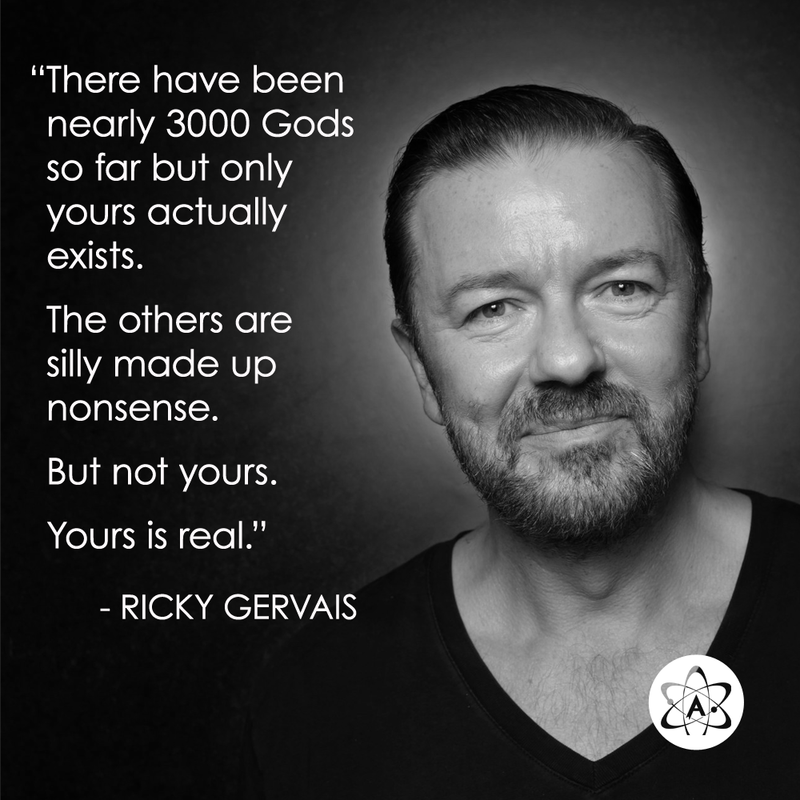 But neither man really said much, and based on how atheists are sharing the clip (and applauding Gervais in the video), they seem to think Gervais won the “debate.” Though what Gervais said certainly sounded clever, he really didn’t say anything at all. Quick Responses to Bad Memes #1 – Click Here. It seems everyone has an opinion about Jesus. Some say he was a wise, moral man; some say he was a myth; some say he was God in the flesh. But first, how do we even know about Jesus? This seems like a pretty basic question, but before we can answer who Jesus ain’t, we need to understand how we know about him in the first place. We learn about specific people in the past by documentation, by records that bear witness to that person’s life, and sometimes other archaeological evidence. Obviously, the farther back in history we go, the more difficult it is to prove the existence of a particular person, even someone as famous and powerful as a king or emperor, let alone a poor rabbi from the backwaters of the Roman empire. So, why is it so hard to conclusively prove the existence of a person from ancient times, even someone as famous and influential as Alexander the Great or Caesar Augustus? First, empirical science is little help; even if we had the assumed body of the ancient person, it’s not like there’s a DNA database we can reference. Further, there are two types of science: empirical and forensic. Empirical science is used to study present, repeatable events. These events can be replicated in studies and witnessed through our senses. Empirical science doesn’t help us with historical events because those events cannot be repeated. For instance, we can’t use empirical science to prove the assassination of Abraham Lincoln. On the other hand, forensic science is used to study past, unrepeatable events. With forensic science, one must look at evidence and use logic to draw conclusions. Forensic science is used in archaeology, criminal investigations, cryptology (the study of codes), and even SETI (Search for Extraterrestrial Intelligence). In proving the existence of a historical figure, it all comes down to documentation – historical records. Alexander the Great and Caesar Augustus lived before the invention of the printing press and the modern information age. Ancient manuscripts were written on papyrus, made from plant reeds, which lasted only about 10 years before falling apart. Later, ancient manuscripts were written on parchment or vellum, both made from animal skins, which could last much longer than papyrus but were still fragile. Additionally, a shortage of ancient manuscripts can be partially blamed on the many conflicts and wars of ancient times. Fire was a common weapon for ancient armies. For example, the ancient library of Alexandria, Egypt was renowned for its collection of manuscripts but much of the library was destroyed during several conflicts. Because of the lack of modern means of copying and saving information, sadly, many ancient manuscripts have been lost to us forever. When we turn to the New Testament, the ancient records about Jesus, we find the individual “books” that compose the New Testament have survived remarkably well compared to other ancient manuscripts. To start, let’s compare the sources for our information about Jesus to sources for two other famous ancient people: Alexander the Great and Caesar Augustus. Interestingly, no one raises questions about whether Alexander the Great or Caesar Augustus existed like they do about Jesus, but, as we’ll see, the sources for our information about Jesus compare extremely well against the sources for these two other famous men from ancient times. Furthermore, Alexander the Great and Caesar Augustus were rulers and conquerors of great empires — the most powerful, famous men of their time period — the exact type of persons ancient historians wrote about. The fact that we know anything today about a rabbi from Nazareth is incredible. We have two sources for our information about Alexander the Great. Both of these sources were written about 400 years after Alexander the Great lived. We have five sources that give us the information we know about Caesar Augustus. One is a funeral writing, written at his death. One was written 50-100 years after his death. The last three were written 100-200 years after his death. 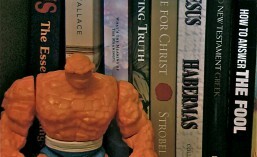 For Jesus, we have four sources — the four Gospels found in the New Testament, each individually investigated, each containing both complementary and unique information. The four Gospels were written 25-60 years after Jesus’ crucifixion, which means within the lifetime of those who knew Jesus and witnessed his ministry. (Jesus was crucified in about 30-33 AD, and all of the Gospels were written before 100 AD.) Two of the Gospels – Matthew and John – were written by two of Jesus’ actual original twelve disciples, where the other two – Mark and Luke – were written by disciples of Jesus’ original apostles, Paul and Peter. This means the four sources we have for knowing about Jesus’ life come from eyewitnesses. Further, we also have Paul’s letters, which are collected in the New Testament, which attest to Jesus’ ministry, crucifixion, resurrection, and deity. The majority of Paul’s letters, historians agree, were written before the four Gospels. For I delivered to you as of first importance what I also received: that Christ died for our sins in accordance with the Scriptures, that he was buried, that he was raised on the third day in accordance with the Scriptures, and that he appeared to Cephas [Peter], then to the twelve. Then he appeared to more than five hundred brothers at one time, most of whom are still alive, though some have fallen asleep. Then he appeared to James, then to all the apostles. This creed is widely accepted by scholars as being dated – at most! – two to five years after Jesus’ crucifixion. Even atheist New Testament scholar Gerd Ludemann believes the creed was created before the appearance of the resurrected Jesus to Paul. Further, some scholars believe the creed appeared within months of Jesus’ crucifixion. But what about actual physical manuscripts – I mean, manuscripts we can actually hold in our hands and read with our own eyes today. Since we already covered how perishable these ancient manuscripts were, how many have survived until this day? First, because of the fragileness of ancient manuscripts, as far as we know, no original ancient manuscripts have survived to this day. Meaning, we don’t have the actual first manuscripts written in the hands of the New Testament authors – or any other originals from any other ancient writers for that matter. These ancient writings have survived through the tedious work of scribes, who copied them by hand to preserve these important works for future generations. We do have actual ancient manuscripts that have survived until today, but just not the originals. So, how does the New Testament compare to other ancient manuscripts? For Homer’s The Iliad, we have 643 ancient manuscripts. For the New Testament, we have about 5,686 ancient manuscripts in the original Greek, either in part or in whole. Plus, there are about 9,000 other ancient manuscripts of the New Testament books in other languages. The earliest ancient manuscript piece of the New Testament we have today is a fragment from the Gospel of John (18:31-33, 37-38). This fragment was found in Egypt and has been dated about 125-130 AD, but could be as early as 90 AD. The dating puts it within 40 years of the original writing of the Gospel of John, and the fragment shows that the Gospel had spread as far as Egypt in that short period! Because of this wealth of manuscripts, scholars can easily compare the ancient New Testament manuscripts through a process called textual criticism and easily identify errors and variants made by the scribes. Expectantly, the scribes, who copied texts by hand, were not perfect, but most mistakes are nothing to be concerned about. The vast majority are spelling mistakes or other simple copying mistakes (like omitting or adding small words or reversing the order of words), which have no effect on how the New Testament is understood. Often skeptics try to portray the passing on of the New Testament over time like the Telephone Game that you may have played in school as a child. In the Telephone Game, someone whispers a sentence into someone’s ear, and then the second person whispers the sentence into another person’s ear, and so on down the line. When the last person receives the sentence, he says it out loud for all to hear. In the vast majority of cases, the sentence is severely corrupted and changed by the time it reaches the end of the line. But this analogy is downright inaccurate. Anyone who claims this is how the New Testament was passed on to us today is basing that belief on assumption and not research, and they’re illustrating their ignorance of textual criticism. Instead of thinking of the passing on of the New Testament as a straight telephone line, think of it as a family tree with many branches giving birth to many more branches. A family tree spreads in many directions as it multiplies; it doesn’t move in a straight line. Thus, if one branch becomes corrupted, the many other branches will not be corrupted in the same way. Further, the Telephone Game analogy utterly fails because the message is only whispered and it cannot be repeated. The New Testament, on the other hand, is a written document; it can be reread and rechecked. To sum up, the Telephone Game has only one line of transmission; the message is only whispered; and repeating is not allowed. On the other hand, the New Testament was passed on through many lines of transmission; it was written; and, therefore, it can be reread, examined, and compared. Christ Jesus is the Savior of the world. Jesus Christ is the Savior of the word. Jesus is the Savior of the word. Jesus Christ is Savior of the world. Jesus [Missing: Christ] is the Savior of the word. Jesus Christ is [Missing: the] Savior of the world. First, we can conclude that the original sentence started with “Jesus Christ,” since only Sentence #1 starts with “Christ Jesus.” Likewise, we can easily conclude Sentence #3 should include the word “Christ” and Sentence #5 should include the word “the” since all the others do. Notice none of these variations so far affect the meaning of the sentence. Though we don’t show this in this illustration, let me point out again, the vast majority of mistakes in the manuscripts by the scribes are simple spelling and grammar mistakes in the original language of the New Testament, ancient Koine (“common”) Greek, which make no difference when the Greek is translated into English or any other language. Finally, we have the variation of “world” versus “word.” This is a tougher challenge to solve because this variation does affect the sentences’ meanings and three of the sentences read “world” and two read “word.” If it were the case that some of the manuscripts contained a nonsense word instead, like “Savior of the worl,” the correct choice would be easy. In this case, I think most would agree “world” makes more sense than “word,” and since more manuscripts have “world” than “word,” it’s the safer bet. But how can we be certain? This is why we’re fortunate to have many, many, many other manuscripts to compare than just these five! Specifically, we can look at those that were written before these manuscripts. The variation or mistake shouldn’t have appeared yet in many of the earlier copies. In textual criticism, the rule of thumb is generally the older the manuscript, the better. In our illustration, it’s likely the vast majority of the manuscripts will read “world.” Thus, we can be confident that the original, correct sentence is Sentence #4: Jesus Christ is the Savior of the world. This is how textual criticism works. Of course, this is simplified for the sake of illustration, but, as you can see, it’s not all that hard spotting the original wording by comparing the manuscripts. There was no central power controlling the copying of the New Testament. Churches were simply sharing the writings with other churches, and they would copy them and pass them on and on and on. One church may have the Gospel of Mark, and another church may have three of Paul’s letters, so they would share and copy and pass on. Archeological evidence proves the New Testament spread rapidly across the ancient world. Thus, in ancient terms, this means the New Testament went viral! And because of this, we have a wealth of ancient manuscripts that can be compared to and contrasted against each other. Textual criticism has found only 1% of the variants have any effect on the meaning of the text, and none of these come close to affecting any Christian beliefs. Textual critics are positive the New Testament we read today is 99% accurate to the originals. Further, the early church fathers, who lived between 90-160 AD shortly after the events recorded in the New Testament, quoted the New Testament so extensively that the majority of the New Testament can be reconstructed from their sermons and writings alone. So, even if we had no ancient manuscripts of the New Testament, we’d still have much of it preserved in the writings of the early church fathers. Obviously, these early church fathers were quoting from manuscripts written earlier than their own writings. First, our current New Testament is faithful to the originals. Despite a lot of assumptions about the Bible being corrupted over time, the evidence says otherwise. Secondly, even secular historians consider the New Testament an excellent historical source, but the supernatural events the New Testament reports make them skeptical of its historical accuracy. Because of this, many non-Christian historians gladly use it to learn of Jesus and the time period but ignore the supernatural aspects of it. You see, their view of the New Testament has nothing to do with the evidence itself, but with their way of understanding the world, their worldview. If someone’s worldview is that God doesn’t exist, then of course he’s not going to believe in the supernatural parts of the Bible. But if someone does believe in God, then believing in the miracles of the Bible isn’t difficult at all. Interestingly, scholars say that the time between the events of Jesus’ life and the writing of the New Testament is much too short to allow legends and myths to develop, especially considering that people who witnessed Jesus were still living at the time of the writing of the New Testament. The writers present the New Testament as a historical record and provide names and other information so their contemporaries could investigate and confirm their claims about Jesus. Where one can argue that this alone doesn’t prove the truth of the New Testament, it must be recognized that the New Testament doesn’t have the unspecific, “other-world-ness” of mythology; it is grounded in a historic time and place. Lastly, no evidence of an early record of a strictly “human-only” Jesus or any other alternative view of Jesus exists. I’ve often heard skeptics say they don’t believe in God because of a lack of evidence. Yet, when it comes to Jesus, many people (even some professing Christians) ignore the best evidence and base their ideas about who Jesus is on creations of their own mind. There is also mention of Jesus outside of the Bible in ancient writings by non-Christians, but these were all written later than the New Testament. Even if someone doesn’t believe in God or that Jesus is the Son of God or that the New Testament is the inspired Word of God, he or she – after evaluating the evidence – should still recognize that the New Testament is our best, most reliable source for learning about Jesus. We know about Jesus from the reliable, well-preserved record of the New Testament. Has the Bible Been Lost in the Translation? How Do We Know the Words in Our Bibles Today are the Original Words? How Do We Differentiate Between What is Scripture & Other Ancient, Religious Writings?